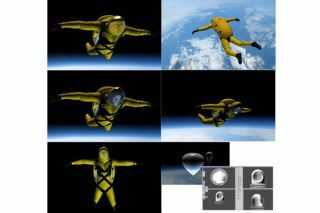 The RL MARK VI Space Diving Ensemble, along with the IVA 3G spacesuit from Final Frontier Design, is intended to provide an out-of this world experience for thrill seekers of tomorrow. Ron Atkins, Curator of the NewSpace Daily, contributed this article to SPACE.com's Expert Voices: Op-Ed & Insights. A futuristic space-suit being developed will take the high altitude adventurer of tomorrow from the total vacuum of outer space, through the searing heat of atmospheric reentry, then down to the surface of the planet earth for a pinpoint landing that even Elon Musk would be envious of and one that Tony Stark, the “Iron Man” himself, would be totally familiar with. Juxtopia’s augmented reality goggles will feed tomorrow’s space diver with a visual display of all the vital information he will need to successfully navigate his way back to the surface of the planet. A pair of gyroscopic boots from Solar System Express will steady the jumper’s descent through the upper atmosphere until the air becomes thick enough for aerodynamic control. The developers plan to test their system using traditional parachute jumps, witha production model of the RL MARK VI estimated for delivery in 2016. Read the full story about the technology in "Revolutionary New Space-Diving Suit Will Rival Anything You’ve Ever Seen In The Movies."